Autumn and winter usher in air that is dry – sadly, that means you often experience dry skin that starts to flake and chap. Especially if you are getting whipped in the face by cold, driving winds on a daily basis. It makes it really difficult to get your skincare routine just right, but it also affects your makeup game. That’s right, you can perfect your makeup with skin care. Here’s how. How can you expect your skin to improve if you don’t keep it fresh and clean? Yes, you’re inviting breakouts upon your face if you don’t ensure it is properly cleansed. The first step in cleansing is removing your makeup every night before bed. A wipe won’t cut it, though, you’ll need to invest in a good quality cleanser to ensure it’s completely removed. Once you’ve done that, you can rinse with water. Are you tired of your skin looking dull and feeling as though you look older than you are? Are you moisturising after every cleansing? This is something that everyone should be doing, even those of us with oily skin! Shop for a moisturiser that is right for your skin type. Remember, the process of cleansing strips the natural oils from the surface of your skin so it’s important to replace that. A rich moisturiser is ideal for anyone with dry skin, while a lightweight option is perfect for you if you have oily skin. I understand the temptation… when spots appear it’s difficult to leave them alone. Even before a whitehead forms you’re up in the mirror trying to squeeze it or picking up unconsciously throughout the day. They will heal slowly if you can’t keep your hands off of them. Moreover, your hands probably aren’t all that clean, so you’re risking spreading those bad-boys. A spot treatment is the solution for this – ideally one that contains salicylic acid. You can apply them after you moisturise. Do so each night until that puppy is gone! Bacteria and oil get trapped within your pores which can cause blackheads, whiteheads, and all kinds of acne breakouts. This is where exfoliation comes in because this will scrub any dead skin cells off, exposing the fresh, smooth skin beneath. It means your cleansing process will be more effective, as will moisturising. 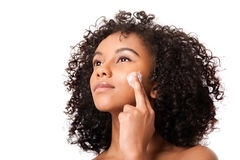 Exfoliation is generally completed three times a week, though it may be different, depending on your skin type. Your body needs water and so does your skin! Staying hydrating keeps moisture in your skin and purges toxins, too. If you aren’t drinking enough water then your body may just be expelling toxins wrong, which results in breakouts. So, step on the scales and weigh yourself, then half that weight and drink that much water every day (in ounces). If you’re 10 stone, you are 140 pounds, which means you should drink 70 ounces of water a day which is equal to 2070ml. Remember, as you use your makeup brushes they’re being coated in bacteria and oil so it’s important that you clean them regularly. That’s why it’s important to invest in quality tools because they withstand cleaning regularly. This should be a weekly occurrence and you can use an antibacterial soap to wash them. Ensure they are rinsed thoroughly and then you can let them dry overnight. Bear this in mind the next time a friend asks to borrow your makeup. You probably don’t think about the grime and grease that collects on your pillowcase, but it does. Even after you cleanse your face, your hair still rubs off on it. If you change your sheets every two weeks, you should clean your pillowcases once a week. If you’re experiencing regular breakouts then you may need to wash your pillowcases even more frequently, you may want to consider changing it daily (if you have particularly extreme breakouts). Here’s something that probably isn’t even on your radar, but it should be. Think about how often you use your phone – the situations you take it into, the places you go with it, and how often you use it in the bathroom, while you eat, and so on and so forth. Now, how often do you put it to your face to talk to your friends? All the germs, oils, and bacteria from your hands are covering that surface. So is your makeup and the oils from your face. Gross, right? Are you suddenly realising that your breakout spot is solely down to holding your phone to your face? Invest in antibacterial wipes and clean your phone at least once a day. Make sure you check out the incredible Holiday deals @ House of Fraser whether you’re on the hunt for the best makeup products, skin care items or a whole host of fashion, home furnishings, and gadgets. It’s the perfect one-stop shop. ← New Makeup Revolution Goodies + Swatches!